This is a repost from my NorCal Beer Blog (here). I plan to post any and all Halloweenish beers here as well so if you read both blogs...sorry...and if not....why not? 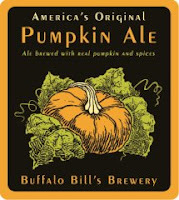 Tonight’s featured beer is Buffalo Bill's Brewery Pumpkin Ale. As I’ve said before, Buffalo Bill's Brewery is the closest brew pub to my house and I feel REALLY fortunate to have such a fantastic place so close to home. I’ve been a huge fan of their pumpkin ale and fall starts for me with my first pint of Buffalo Bill’s Brewery Pumpkin Ale (and I always like fall to come early and often). And since I brewed my first batch of Pumpkin ale this year, I thought I’d add a little something I found from Geoff Harries of Buffalo Bill’s Brewery about brewing their pumpkin ale, “Brewer: Geoff Harries of Buffalo Bill’s Brewery in Hayward, California. Geoff homebrewed from 1981 to 1987. He became the head brewer at Buffalo Bill’s from '87 to '89, then the GM and head brewer at Brewpub on the Green from '90 to '93. He bought Buffalo Bill’s and is now the owner and head brewer - " Our pumpkin beer is brewed at several locations for us, but one definite rule is that we always use fresh, whole pumpkins. The kinds vary depending on the season and what is ripe, but we like to use Atlantic Giants and Big Macs. Both are jumbo in size and have lots of fiber. Especially the fiber makes for easier mashing. We roast the pumpkins, since a raw pumpkin is really nothing but a squash and if you try to use them raw, nothing comes out of them. Roasting converts some of the starch inside the pumpkin, and lets us extract sugars and sweetness. We cook them to the point where they’re kind of done—maybe a little brown around the edges, just when they are starting to caramelize. But we don’t want them turned to mush. Since pumpkins come in all different sizes, cooking times will vary. Once they are ready we cut them open and pull out the seeds. For six-and-a-half barrels, we use about thirty pounds of pumpkins, though this will depend greatly on the pumpkin. This is a bit more than one-half pound for a five gallon batch, but once you start brewing you’ll realize you don’t want that much pumpkin anyway. Remember, this is a beer, not a vegetable beer. The pumpkin is there to complement the malts, not take them over. Besides, too much pumpkin makes for a tough sparge. We always experiment with the base beer, but it’s generally a red ale/amber beer. We are looking for something with an orange to red hue. All the color in the beer comes from the malt. None comes from the pumpkin. We go through the standard sparge. We have had trouble with this stage in the past, and what we have discovered is if you overcook the pumpkin it gets all mushy and causes the stuck mash. So, it’s important to not over roast. Hops should be low-key. Be subtle, just to balance the malt sweetness. You don’t want the beer to be bitter. Think pumpkin pie in a glass, and shoot for that flavor profile. The dominant character will be the up front malt flavor, followed by a finish that highlight the spices of cinnamon, nutmeg, and clove. And speaking of spices, we use whole spice. This year we’ll put them in a big sparge bag, and then hang them in the conditioning tanks, after the boil. This is the way to get that nice, spiced character because it’s kind of like dry-hopping." Appearance: Pours a deep, dark orange with a nice white head and mild lacing. Aroma: Smells like Halloween (or Thanksgiving) with pumpkin, cloves, cinnamon, nutmeg and just a touch of caramel malt in the distance. Taste: “Pumpkin pie in a bottle” is right. Tastes like the holidays with all the noted spices (clove, cinnamon, nutmeg and perhaps allspice) as well as pumpkin. Malt and hops are there, but are balanced perfectly to allow the spice shine through. Overall: I’ve said it many times…I love this beer. Pumpkin Ales aren’t for everyone (I know), but for me the complexities of Buffalo Bill's Brewery Pumpkin Ale is what makes this so drinkable. Smooth, creamy, spiced just right and light enough to session. At 5.2% this beer is perfect to enjoy throughout a nice holiday meal without getting too loopy in front of guests. I had the chance to enjoy my first pint on September 9th. This beer is fantastic on tap. If you can go to Buffalo Bill's in Hayward (or find it on tap) I highly recommend that you do! I am eagerly awaiting their Imperial Pumpkin Ale a 9.8% ABV MONSTER (photo to the left is me enjoying my first glass of it last year). They had intended on bottling it, but at this point I’ve not heard. If they do…look out…I’m buying CASES! I love seeing displays of Buffalo Bill's Brewery Pumpkin Ale when I’m out and about. I found this one at Cost Plus World Market. Good price on the beer too ($6.99 a six pack). Pick some up! You’ll be glad you did!